SUJAN reopens its Relais & Chateaux luxury tented camps this month for the beginning of the Winter 2013 season. The Serai, the ultimate desert oasis in Jaisalmer, will open on 24th September, followed shortly after by Ranthambhore’s original safari camp, Sher Bagh, close to the world renowned Ranthambhore Tiger Reserve, on 1st October. Both properties offer an ideal base from which to explore two of the legendary forts of Rajasthan that have recently been awarded UNESCO World Heritage status: the ancient 10th Century Sawai Madhopur Fort located within the Ranthambhore National Park and the golden 12th Century Jaisalmer Fort, the world’s largest living citadel. SUJAN’s team of attentive and highly knowledgeable staff and historians will arrange guided tours into areas of each Fort, which have not yet been revealed to the public. Also new for Winter 2013 is the SUJAN Romance Package, offering exceptional honeymoon experiences either in the quiet romance of the desert or amidst the excitement of the jungle, with a glass of champagne on arrival, a complimentary couple massage and a private dinner set up within the grounds of each property. 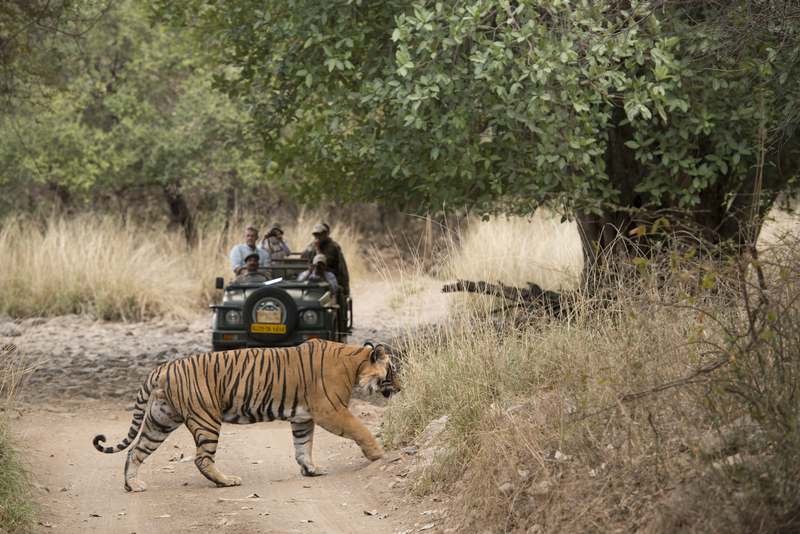 Along side exhilarating game drives and excursions, Sher Bagh’s resident historian, Yusuf Ansari gives guests the chance to enjoy private walks and picnics on the ramparts of Ranthambhore Fort. The National Park has seen a surge in wildlife sightings, including tigers, with a summer ‘baby boom’ as three Tigresses have given birth to cubs and at least 11 young tigers are ready to disperse and start families of their own. 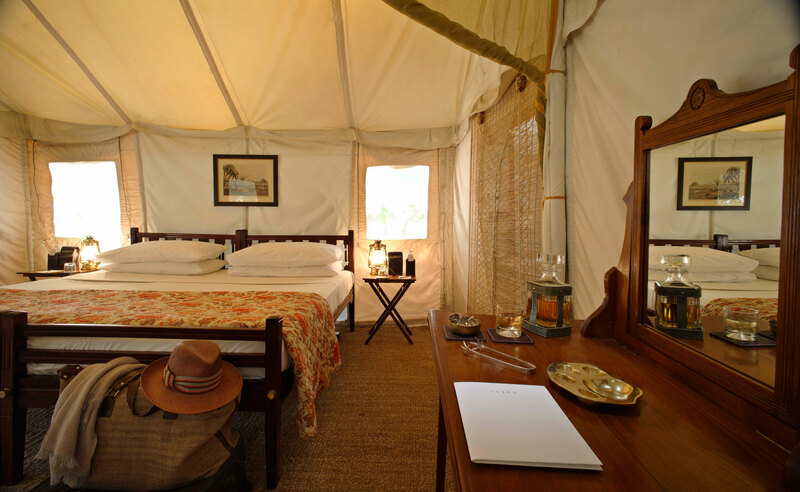 Located on the edge of the National Park, Sher Bagh’s 12 hand-stitched canvas tents with en-suite bathrooms and private sit out areas are furnished in the campaign style. A hand crafted swimming pool looking onto the Aravalli mountains and The Jungle Spa offer welcome respite after exciting days in the jungle. Guests experience luxury with a conscience as 70% of the hotel staff is drawn from the local community. Sher Bagh supports surrounding villages through a number of initiatives including educational workshops, recycling and reforestation whilst working very closely with the Department of Forests in patrolling and monitoring exercises around the Park. The Swimming Pool at Sher Bagh, Ranthambhore’s original safari camp. Each of the 21 tents at The Serai offer spacious living areas, filled with antiques and six of the Luxury Tented Suites offer private plunge pools. 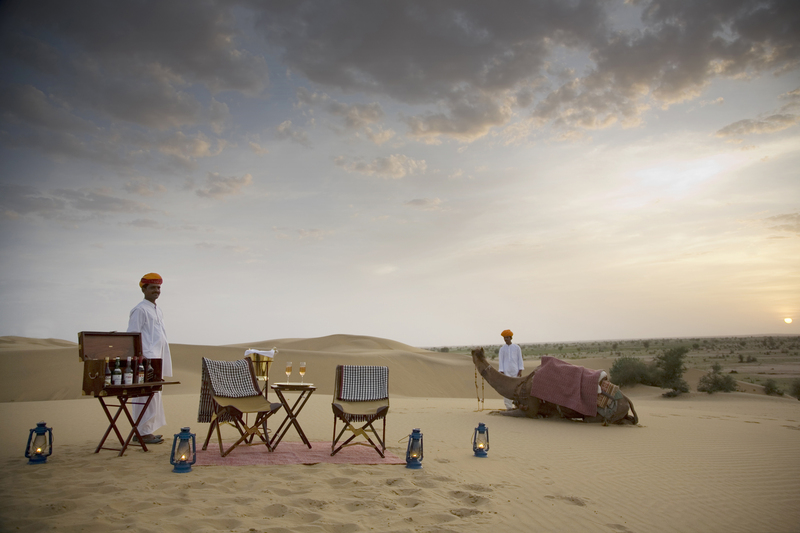 At sunset, guests enjoy spectacular views from the privacy of their tents or outlying sand dunes and Al fresco dinners are enjoyed whilst listening to the haunting melodies of the desert, performed by Manganiar tribesmen, the custodians of a musical tradition as ancient as the forts of this enchanted land. Guests are encouraged to take a break from the tourist trail and indulge in a new Wellness Offer. For an additional daily charge of 4000 INR (£40 GBP approx), enjoy one daily treatment at The SUJAN Spa, choosing from a menu created by Raison D’Etre using indigenous herbs and oils from the Thar desert, a seasonal juice and the opportunity to prepare Rajasthani desert cuisine with the resident Chef using fresh produce from the Organic Vegetable & Herb Garden. This entry was posted in India, Jaisalmer, Rajasthan, Ranthambore, Safari, Tiger, Travel, Uncategorized, Wildlife and tagged Aravalli Mountains, Forts, Jaisalmer Fort, Jungle Spa, Legendary forts, Luxury, Manganiar Tribesmen, Rajasthan, Ranthambhore, Romance, Safari, Sawai Madhopur Fort, Sujan, Tented Camps, Tiger Reserve, Tigers, UNESCO World Heritage, Wellness, Winter 2013. Bookmark the permalink.